A 3D printer starts with the bottom layer, waits for it to dry or solidify, and then works its way up. This layering process differs depending on the printer and the material it works with. 3D printing has found its applications in biology. 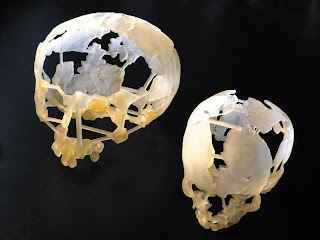 For example the skull of a baby Homo nenderthalensis was made by plastic spitting 3D printer at the University of Zurich, Switzerland [See Figure].